The population of the Philippines is surpassing 100 million in late July 2014. That’s a reminder of the country’s importance in global migration. Emigration generally has the strongest impacts in countries with relatively small populations, such as El Salvador, Armenia and Samoa. 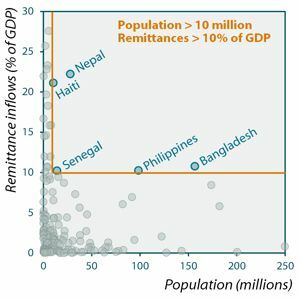 In fact, as the scatterplot shows, only five countries have remittance inflows representing at least 10 % of GDP and a population of at least 10 million people. Among them only Bangladesh and — as of July 2014 — the Philippines have populations of 100 million or more. The Philippines has a particular position also in research on migration. I have never done research on Filipino migration myself, but the rich literature has been a source of inspiration and influence on my work on transnational families and gender, for instance. In my report on gender dimensions of international migration for the Global Commission on International Migration I used research on migration from the Philippines to analyze the diversity of approaches to gender in migration studies. Issues of gender relations, family and parenting remain central in research on Filipino migration. Perhaps because there is so much existing research to build upon, many new studies are particularly innovative and bring new perspectives to the study of migration worldwide. Below, I have compiled a selection of five recommendations from recent research on Filipino migration. These are all articles in academic journals, and, unfortunately, require a subscription. Among the freely available resources on Filipino migration is Jason DeParle’s A Good Provider Is One Who Leaves, published in the New York Times Magazine. Aguilar, Filomeno V. (2013) ‘Brother’s keeper? Siblingship, overseas migration, and centripetal ethnography in a Philippine village.’ Ethnography, 14(3): 346-368. Fresnoza-Flot, Asuncion (2009) ‘Migration status and transnational mothering: the case of Filipino migrants in France.’ Global Networks, 9(2): 252-270. Madianou, Mirca (2012) ‘Migration and the accentuated ambivalence of motherhood. The role of ICTs in Filipino transnational families.’ Global Networks, 12(3): 277-295. McKay, Deirdre (2007) ‘‘Sending Dollars Shows Feeling’. Emotions and Economies in Filipino Migration.’ Mobilities, 2(2): 175-194. Paul, Anju M. (2013) ‘Good Help is Hard to Find: The Differentiated Mobilisation of Migrant Social Capital among Filipino Domestic Workers.’ Journal of Ethnic and Migration Studies, 39(5): 719-739. Previous Previous post: What happened off Lampedusa?